The new top of my IKEA “Alex” desk needed a replacement. Not that it was worn. I hadn’t started using it. This note describes what I did and why. The IKEA Alex is described here. I’m sure Alex satisfies most uses, but for me it turned out to be an unusual starting point. I built the new top from two plates of 15 mm of “B/BB” class (no knots) birch plywood (131 x 60 cm). I painted them with white oil paint on both sides, then polished the paint off with a cloth almost immediately – so that the wood patterns are still visible – and at least some protection is added. The plywood does have Water and Boil Proof (WBP) phenol-based glue. 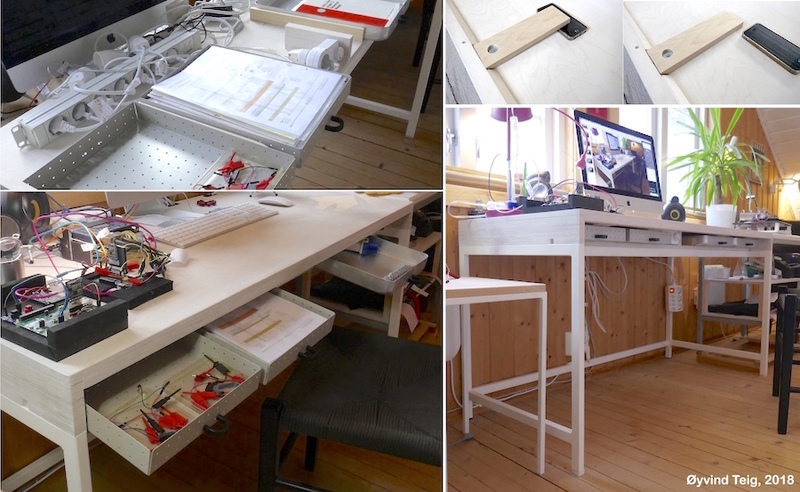 The top of the desk now is about 4,5 cm lower than the 76 cm of the IKEA table. This was reason #1 for the change. It simply was too high. I made a full, contiguous top surface. This way I can push the desk-top screen into position without hitting the hinged bonnet of the cable management unit, that seemed to not get 100% into position by a millimetre or so. Besides, I didn’t want to see the surface of the top being flaked off. I imaged the unit a year into the future with my usage. This was reason #2. A single nice-staying top surface. I made space for the extension cable, connecting cables, power adaptors and cords between the two top layers. Now there is enough space for that stuff. This was reason #3. And ventilation holes for cooling – almost like in IKEA Alex. The top surface can be lifted off should I ever need to do some woodwork in that space. An upside-down screw in each top’s corner with cut-away head and not visible thread, forming steel pins. The corresponding bottom corners have holes with plastic tubes from some other screws. The IKEA Alex desk didn’t need this, it’s a new need when I don’t have drawers. (I did add drawers later). Besides, IKEA units may at any time be re-flat-packed; all is screwed or pushed into position. They are experts at that. And now, the cable compartment can be accessed from the front or the rear without moving the screen, speakers and flower-pot. Not that I expect to do it often, but IKEA’s solution wasn’t made for my usage. Reason #4. The lower, front part of the top now starts on top of the horizontal steel profile. I indicated this site with a square hole in the sides. My problem with the IKEA table was that when I (being a normal sized adult) raised from the chair, my thighs tried to lift the whole desk. Not nice for what was on the desk, not nice for my trousers, not nice for my thighs. Reason #5, even if I assume that an office chair with wheels might have helped too. I glued the sides from cut “lists” of plywood, and glued them to the bottom surface. The wires I now take through cuts (like a room with an entrance, seen from the top) from the rear part, framed with plastic from a 5 mm cutting board. Lift up the frame, insert the wire in the cut and then twist the plastic frame around, then push the frame in position. I guess this is reason #6. This may be my invention, I haven’t seen it before. But I haven’t told reason #7 to make this new table top, even if it may be inferred from the picture. This reason is for allowing me to make it: the nice under-frame. It’s made by steel, coated with pigmented epoxy/polyester powder. The back part is a single, welded structure. The sides as are also welded. The parts are then push together and locked by the screwed-on top. The final desk is still as slim as I wanted it. I looked for other steel frames, IKEA Alex beat those I could find. That was the main reason for buying it. However, I did have a problem screwing the bottom surface to the frame. I didn’t want the screws to be visible, so I had to bore new bottom holes: 10 mm. I then had to make 9,5 mm washers and balance them with the screws into the top of the profiles, inside the profiles. Because the top holes are too wide for any of my small screws. I chose to have the rear open. Even then I imagine it would be ok as seen from the rear. The IKEA Alex has a closed rear. Altogether the cost now is about the double of the desk’s price. I may be able to get rid of the spare IKEA top. My youngest daughter said she knew someone who had one that used to be new but now didn’t look too nice, a couple of years old. In my taste IKEA compromises too much in the quality of the different parts of a single furniture. But IKEA industrialise, earn money and deliver at affordable prices. However, what quality is about is certainly worth thinking about (ref: Pirsig, “Zen and the Art of Motorcycle Maintenance”) – for me, and perhaps also for IKEA. Which I am sure they do. But again, IKEA (and their designers, I assume) excel in giving their customers affordable, good enough goods. They are thus easy to love and hate. A new Alex (if assembled with only the two required thumbs), or older and little used, surely looks nice. But my solution isn’t too bad, either. (Update Mar201) After two years of use I was tired of having my little pile of paper printouts fall on the floor every time I needed a sheet. I also thought that the compartment underneath the top was too much of a hidden place. So, in a shop I found the HAY “punched organizer” and also the HAY “aluminium tray”. I bought one of the first and found that its height was spot on by the millimetre: a perfect drawer. And it was at half price since it was last year’s colour. But the shop had only two. However the aluminium tray cost the same so I also bought two of them, since I knew I was able to cut their heights by about 5 mm with my nice Proxxon 27070 FET saw. I still had some of the IBM handles with inch screws left (after using the majority of them on my Thin material wooden cabinet with floppy doors). I made wooden guides for the drawers so they slide nicely and stop in inner position – and stop abruptly in pulled-out position when they must. Because with the design of the Alex, where the tabletop and the lower top start in front, the lower further in than the tabletop (very nice for the thighs), it was easy to pull the drawers out and ouch.. everything would fall on the floor. Again! I then had to make a stopper for each (Fig. 2, upper right, what you see is underneath the top plate). It’s hard to describe, but if you press the picture you will see the details in full. The mobile there shows how much the stopper falls down in stopping mode, and it’s easily adjustable with the screw. To pull the drawers fully out a finger is needed inside to push the tongue up (yes, maybe that’s the name. I have seen these made by metal in older furniture). I do mention “IKEA”, “HAY”, “IBM” and “Proxxon” but only for your help. As always, my Standard disclaimer is valid! ©2016, 2018 – The top design and woodcraft by Øyvind Teig, Trondheim, Norway. Please help me with the English terms here, I’m not a woodwork-English specialist. 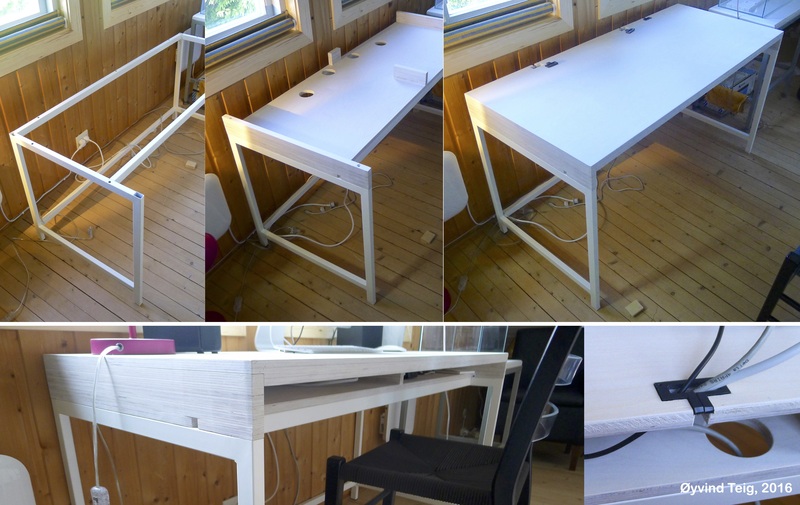 The IKEA Alex desk is designed by Johanna Asshoff. Thanks for the nice starting point! Summary in Norwegian: Ny topp på en IKEA Alex arbeidspult (kontorpult). Les om den her. Toppen min er nå lagd av to 15 mm B/BB finerplater uten kvist, malt med oljemaling (over og under) som jeg tørket av veldig fort, slik at fineren er synlig. Nå har jeg en hel toppflate uten sprekken fra lokket til den innebygde kabelsamleren. Den øverste plata kan løftes av om jeg skulle ønske å lage noe lurt imellom. Den er 30 mm tykk i front, lagd med en ekstra 15 mm som jeg skrudde fast, slik at jeg kan angre om jeg vil inn med skuffer igjen. (Senere angret jeg, jeg komemr til det.) Kantene på den originale sprekken i den øverste plata var ikke helt i plan og utsatt for framtidig slitasje. Uten dette lokket trenger jeg heller ikke flytte på det som står oppå når jeg skal nedi der etter noe. Kabelsamleren ble også for liten til mine saker. Nå er skuffene borte, og ledningene og strømadaptere ligger løst mellom platene. Men det viktigste er at den nederste plata ikke starter helt framme, men ved stållista – slik at ikke hele bordet løftes opp når en voksen person reiser seg. (En kontorstol med hjul ville nok også ha hjulpet.) Det er også hull til ledninger og kjøling i den nederste plata. Og i den øverste lagde jeg tre spor med rammer av ganske myk skjærefjøl i plast for gjennomføring av ledninger. Nå er toppen ned med 4,5 cm fra 76 til 71,5 cm – passe høyde for meg. Stålramma til IKEA er et supert utgangspunkt å bygge videre på, siden både baksiden og sidene er sveiset til tre hele deler. Jeg tuklet fælt med å få skrudd fast den nederste plata. Måtte utvide den nederste hullene til 10 mm og måtte lage 9,5 mm skiver som jeg balanserte sammen med skruene opp, inni profilene. Jeg ville ikke at skruene skulle være synlige. Totalprisen med 1.22 x 2.44 m 15 mm B/BB finer blir omtrent det dobbelte av IKEA sin pris for Alex. Har noen bruk for en nesten ubrukt Alex-topp så bare si i fra på finn.no-annonsen her. Senere lagde jeg skuffer av oppbevaringsbokser fra HAY, to lakkerte i hullstål (“punched organizer”) og to i aluminium (“aluminium tray”). Jeg lagde skillelister og stopp innvendig, men også stopp slik at skuffene ikke kunne dras helt ut og alt innholdet falle på golvet. For å ta skuffene helt ut må jeg putte hånda inn og dytte stopplista opp slik at det blir klaring til skuffen. Denne stopplista er festet med en skrue, og tyngdekraften gjør resten. Jeg hadde noen håndtak fra noen IBM diskarray som ble faset ut på jobb som ble fine på skuffene. De har tommeskruer! OBS: “IKEA”, “HAY” og “IBM” er nevnt for din del, jeg har ingen annonseinntekt, får ingen gaver, har bare morro og utgifter med hjemmesiden min! Se Standard disclaimer.